Aha... now here's the exciting part. Part two of Alter Ego (or really, probably part one, you can't really Keep It Under Cover after you've already revealed your mystery), Keep It Under Cover. This half is filled with glass fleck sparkle, duochrome shimmer and vibrant color. Alias. This color has so many faces... It's purple, it's blue, it's glass fleck... It has yellow flash, green flash, red flash... Purple shimmer! Silver shimmer! Pink shimmer! It's freakin' awesome. Alter Ego. This has a very greyed-out purple base with crazy gold and silver glass fleck shimmer. Very, very shiny... Very cool to look at. Masquerading. This is an interesting color. You'll notice in the first picture that it dries matte. I'm not sure if it's intended to be a matte, it doesn't seem to have that typical matte formula and it doesn't chip as easily as mattes do... Just a bonus feature, I suppose! In the second picture I've added topcoat. It is a metallic grey-teal, a touch on the frosty side but not super streaky. Nice depth to it, though... Looks light in the middle and dark on the edges, I love that! Black highlights! Secret Agent. Gorgeous silky vibrant purple. It's a frost. Like Masquerading, it's a silky frost, not a streaky frost. Just a very fine shimmer with a soft-feeling formula. Makes me think of Jessica Birds of Paradise or something. Total Mystery. I have to apologize for these terrible pictures. Why does it always have to be that the best colors are the hardest to capture? This is the best color I've seen in a while. It's crazy. It's bright blue and purple. Blurple? It's duochrome and shimmery. It's like OPI Ink on steroids. Everyone who saw me wearing it commented on it. I just grabs your eye and won't let you look away. If you like blue or purple, you have to get this one. At least see it in person if you can. Ulterior Motive. This is a fun one, too. It has a dark pink / dark fuchsia glass fleck base and lots of very visible blue and purple glass fleck pearls. Go ahead, enlarge the pictures, check out those sparkles! I love blue sparkles! The formula on these was great as well. No application issues to be found. Great dry time and wear time. Opacity was good, but I did three coats on all just to see what it looks like. Also, since this set comes with the Vivid 10 Color Intensifying Topcoat, I put a coat of that on as well. The Vivid topcoat is a lot like the Milky White basecoat; it has a slight blue-violet tint and it brightens colors. It's not really that noticable. It is a very nice topcoat, though. Very shiny, adds a little brightness. It makes a perfect refresher topcoat if your mani has lost its shine. Dries quickly. Now, this collection has me excited. The excessive amount of purple and duochrome make my heart skip a beat. Every color is great and beautiful. Total Mystery is a definite must have for me, and I'm thinking about getting a few backups, I love it so much. And hey... purple glass fleck duochromes for spring? I have to love them for that. Sure, they did pastels too, but they did this at the same time! They gave us holos and duochromes and glass flecks for spring a few years back... Now every year I can't wait to see what Color Club is going to do next. Always a surprise. I agree, it's fun to avoid seasonal colour chichés! I found these @Ross and was dancing around like a fool in love when I did! I've seen other swatches, but yours are really outstanding, Scrangie! Now I'll have to pick up a few - it's all your fault! :P Hahaha! So there is no glitter in this just shimmer and glass fleck? I'll have to keep my eyes peeled at Ross for it, I was able to get the other 1/2 of the Alter Ego collection which is nice in it's own right but not really fun. Very beautyful collection and I love alias and alter ego! Could you please do a comparison with Total Mystery, OPI ds Magic and Orly Lunar Eclipse? I know the last 2 are very close, but my guess is that Total Mystery might be close too. Want, no, need the last two. Gorgeous! Is there any way for us outside the US to buy these? 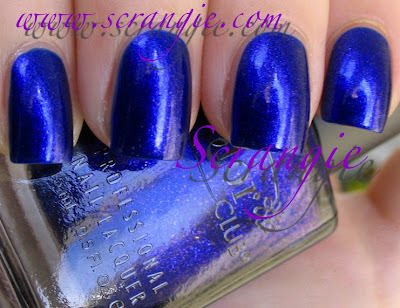 I have Alias as it looked so beautiful in the bottle but I didn't get the same thing on my nails. It was just purple until I really looked and moved my fingers then I finally got a little green out of it but it was not in the least easy or obvious. I feel like mixing it with Hard Candy's Beetle - I think that would really be fantastic. Did I do something wrong or are you just better at it? I love Masquerading, Secret Agent and Total Mystery. Great swatches! total mystery is gorgeous, definitely my favorite of them all. I need Alias, really. Thanks for these wonderful swatches, you're the best! Love love love Ulterior Motive and Total Mystery!!! Super gorgeous. You know...I always love Color Club's releases and the formulas on everything. i really don't own enough! I just love Color Club! This is an amazing collection. More temptation that I may buy soon. Batcheeba, Head2Toe Beauty carries this collection - and their shipping info says they do ship outside the US. Collection is here http://www.head2toebeauty.com/nail_polishes/npo_color_club1.htm and shipping info here http://www.head2toebeauty.com/info.htm#ShippingInformation Hope you're able to get them, this collection looks amazing! I love color club, and I just recently discovered how awesome their base/top coats are! I definitely recommend them to anyone who thinks that Seche Vite is too thick and has issues with staining. In fact, the color club top coat is the only one that doesn't give me bubbling issues with Zoya! Also, anyone know what's up with the color club sets from Ross? The brush handle is different (smooth plastic, no flower logo) and the bottles don't have labels with the color names. If anyone knows, please provide some insight! alter ego and ulterior motive are so cool! This is another collection I'll have to buy! Love all these shades. *Congrats* You just made me add Alias to my WL.